Born in Nottingham to West African parents, the playing career of saxophonist Tony Kofi began when he chanced upon a series of jazz workshops, run in Leicester by Nick Hislam. Tony also took lessons from local saxophonist and jazz mentor George Carmichael and was bitten by the jazz bug and made a point of making the journey to go along to each session. This laid the seeds for what was to come, a four-year stint at the legendary Berklee College of Music in Boston Mass. USA, on a full scholarship music diploma. While in the US, Tony studied with such musical luminaries as Andy Magee and Billy Pearce, gaining invaluable experience that he then put to best use when he returned to the UK. From 1991, Tony was part of the UK’s leading jazz group of the time – The Jazz Warriors. This band was (and, indeed, is, in its current form of Tomorrow’s Warriors) a hotbed of young talent from the UK jazz scene. Tony was also vital part of Gary Crosby’s Nu Troop; this was a big stepping stone for his solo and ensemble work, contributing massively to his own solo projects and educational projects. Tony is still committed to this ethos, regularly running his own workshops and giving individual lessons. Throughout the nineties Tony was busy, appearing in the front line of innumerable high-profile musicians and groups, including Billy Higgins, Byron Wallen’s Indigo, Claude Deppa’s A.J.E. & Horns Unlimited, Cheikh Tidiane Fall Quintet, Clifford Jarvis, Courtney Pine, Digable Planets, Donald Byrd, Dr Lonnie Smith, Eddie Henderson, Gary Crosby’s Nu-Troop, Julian Joseph Big Band, Jazz Jamaica All Stars, The David Murray Big Band, US-3, Tim Richards’ Great Spirit, The Grand Union orchestra, and Lucky Ranku’s African jazz all stars, as well as composing original music for his Ten piece group, the Afro Jazz family. The Tony Kofi Quartet is dedicated to bringing the music and genius of the 20th century jazz composer, Thelonious Sphere Monk, performing his complete works to new audiences in celebration of his unique improvisational spirit and formidable creative output. 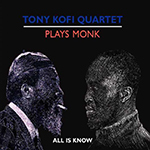 Since 2000, Tony Kofi, Jonathan Gee, Ben Hazleton and Winston Clifford have been building their repertoire of Monk's compositions, all 70 of which were performed in a groundbreaking, marathon six-hour concert at the 2003 and 2007 London Jazz Festival. The Quartet's 2004 album, All Is Know (Specific Jazz SPEC001), features a selection of Monk originals with additional string arrangements by composer Philip Clark. Between 2003-2004 Tony was an integral part of the late Andrew Hill’s Anglo-American Big band and Sam Rivers Rivea Orchestra. The Tony Kofi Trio +1 is yet another project of original compositions by the double award winning Saxophonist/Composer, which features Byron Wallen, (Trumpet), Anders Olinder (B3 Hammond Organ) and Winston Clifford, (Drums). The group also augments into a six piece as heard on their 2006 album titled Future Passed (Specific Jazz SPEC004), also featuring Robert Fordjour (Drums) Cameron Pierre (Guitar) and Donald Gamble (Percussion). The 2006 release, is a true music lovers album in which you get to hear the blues, gospel, jazz, funk, Latin, African, be-bop and beyond. It will take you on a historical journey, a journey of his own life experience, Future Passed. 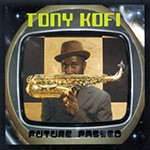 In 2006 Tony got a call from saxophone Jazz legend David Murray asking him to join the historic avant-guard jazz ensemble the World Saxophone Quartet which formed in 1977, this is a milestone in British jazz, Tony is the first UK born musician to join the all american group since the passing of the late Saxophonist Julius Hemphill. More recently Tony has been working with the Harry Connick JR big band performing on the Michael Parkinson show, The Paul O'Grady show and a live BBC jazz line up recording. Tony also performed on the Parkinson show with music legend Joe Cocker, and is a committed member of Courtney Pine’s Jazz Warriors. 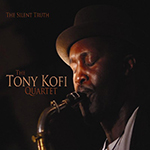 In January 2008 Tony took his quartet back into Specific sound studio to record their most recent album to date titled The Silent Truth (SPEC008) released April 2008.